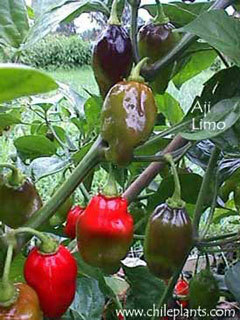 All photos Copyright © Cross Country Nurseries AJI LIMO - hot; 1.5 to 2.5 inches long by 1 to 1.25 inches wide; medium thick flesh; matures from pale yellow to purple splotched to yellow to orange to red; pendant pods; green leaves; 18 to 24 inches tall; Mid Season (70-80 days); from Peru; IMPORTANT NOTE:This is NOT the variety mentioned in Mother Earth news!! See Lemon Drop or Peru Yellow. ; C.chinense.